It is highly improbable that a potential reader would have any idea as to the critical import of the title A Good and Useful Hurt or the exciting adventure that awaits them. Seldom does a book come along that has more surprises than this one—not all of them pleasant or easy to digest. At center stage in A Good and Useful Hurt are tattoos in all their rare and artistic forms and the unusual and fascinating cast of creators of body art. These often unique body decorations are designed and implemented by a group of artists who cater to the whims and desires of their customers. At regular intervals, both upstanding and unsavory clients stream through the shop to be beautified. The shop’s owner, Mike, is a stabilizing force in the community and a talented tattoo artist. Yet he is still haunted by the tragic death of his former girlfriend. When another body piercing artist, Deb happens to come into the shop, he realizes her skill and charisma would be a welcome addition to his customer base. Mike, his right hand man Lamar, assistant Becky, and the new gal Deb become fast friends and look out for each other like a close-knit family. And though Mike and Deb seem like an unlikely pair, they fall in love and she quickly moves in with him. Theirs is a quirky but wonderful relationship. In a parallel plot, a serial killer is roaming the streets stalking and torturing unsuspecting women. The reader hears Phil’s (the killer’s) thoughts aloud as he schemes about, fantasizes about, and hunts for new victims. The suspense of who will be his next victim builds intensely throughout the book. The reader is not quite sure at first as to how this subplot is related to the story as a whole, but the reason slowly reveals itself—and the way it is woven into the core of the story is masterful. Out of the blue, a customer enters the shop to request a special tattoo that would include a mixture of his deceased son’s ashes with the ink in remembrance of his beloved boy. During this process Mike begins to believe deeply that “a tattoo is an energy exchange and that a tattoo with ashes carried wild energy.” His connection to the energy he feels while implementing the tattoo makes his “hands wobble in a way they hadn’t wobbled in twenty years.” Mike doesn’t quite know it yet, but this is the beginning of a journey that will change his life forever. In a dramatic twist, Mike gets personally involved in the energy of tattoos with ashes of the dead. A further twist leaves him with an uncanny ability to envision the victims as they appear after they are killed—bruised and bloody and very much alive and ready to exact revenge. Mike soon finds himself plotting to avenge the deaths of several victims known to him by tracking the killer. The complicated and suspenseful plot line in A Good and Useful Hurt comes out of left field in the most surprising manner, and though implausible in real life, the supernatural overtones in the novel certainly add to the book’s interest. There is only one small flaw within the story of the book. A subplot about Deb and Mike breaking into a local museum as a form of excitement for the two of them appears to be irrelevant, lessening the impact of an otherwise streamlined story. 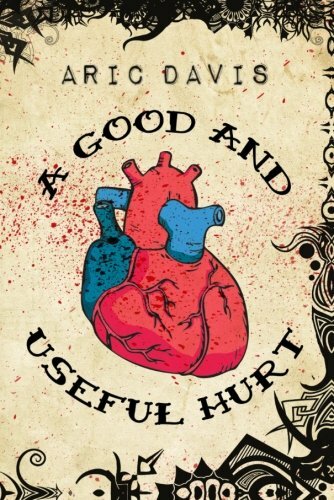 Although A Good and Useful Hurt is a unique thriller with characters quirky enough to be interesting, there is an intangible magical ingredient that is missing that would make this book completely compelling. Yet after all is said and done, A Good and Useful Hurt offers up a thriller that holds the reader’s attention.